The McIntosh Fine Arts Department presents “Little Women: The Broadway Musical,” on Friday, Feb. 1, and Saturday, Feb. 2. Performances are at 7 p.m. both days, with a matinee at 2 p.m. on Saturday. Tickets are $12 for adults and $8 students. Tickets can be purchased at the door or reserved by emailing info@mcintoshtheater.org. “Little Women” tells the classic story by Louisa May Alcott of the adventures of the four March Sisters and their steadfast mother, Marmee, as they try to survive while their father and husband is serving in the Union Army during the Civil War. Little Women is directed by drama teacher Ken Buswell. The musical director is Hannah Beth Potter, choral director at MHS. Costumes are by Joanna Clarke and Kendall Bryant. Sound is by Junior Annie Vender and lights are by Senior Cole Pickering. The show is stage managed by Senior Grace Kilgore, and the prop master is Audrey Kaszonyi. 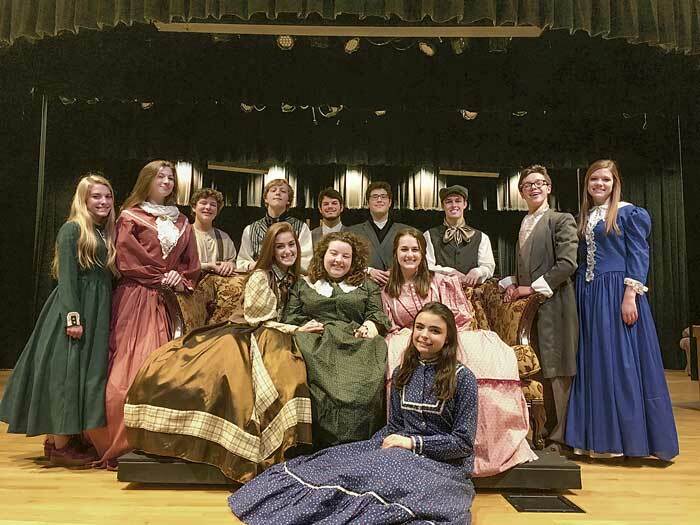 The cast includes numerous Regional One Act award winning students, including Emma Skaggs as Jo March (twice named to the All Star Cast), Lydia Campbell as Marmee March (All Star Cast), Clay Lawhead as Laurie (Best Actor winner in 2017), Iain Hemenway (Best Actor winner 2018), and Ava Whiteley as Aunt March and Mrs. Kirk (Best Actress, 2018). The cast also includes Lauren Schimandle as Meg, Emily Grace Childs as Beth, Anna Seville as Amy, Ryan Robertson as Mr. Laurence, Colton Hayes as Mr. Brooke, and Natalie Cardon, Jack Choat, Allie Cincera, Jack Hemenway, and Tiffany Smith in the ensemble. An orchestra of 14 students will be conducted by Hannah Beth Potter.